Grading dates are shown below. Player grading only begins at U9 for Mixed/Boys teams and at U10 for Girls teams. Girls U9 (W9) players are not graded. Grading for Mixed/Boys U9 is optional but is strongly recommended for those players who wish to be placed in a suitably competitive team. For Mixed/Boys U9 players who choose not to attend grading we’ll attempt to keep you with last year’s team mates. Mixed/Boys U9 (who elect to grade), U10, U11, U12 and Girls U11, U12 players are required to attend two (2) grading sessions. 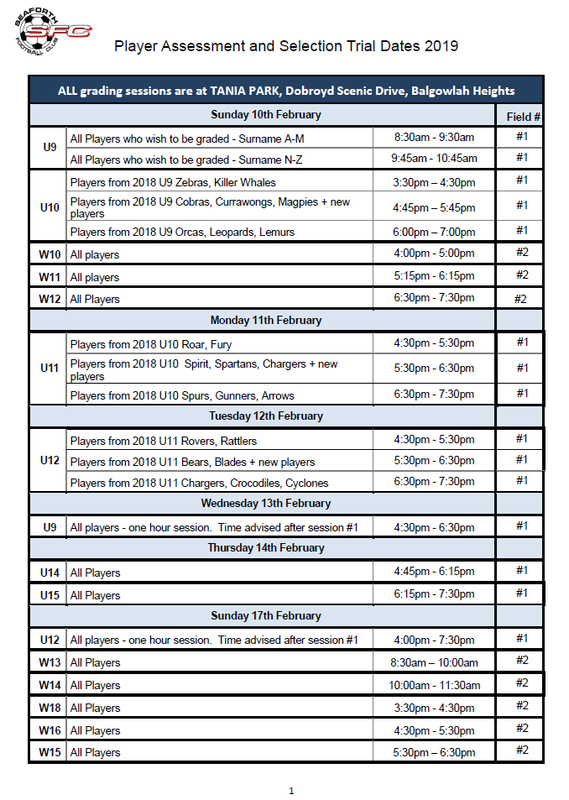 U13/W13 to U18/W18 players will usually only attend one (1) grading session. 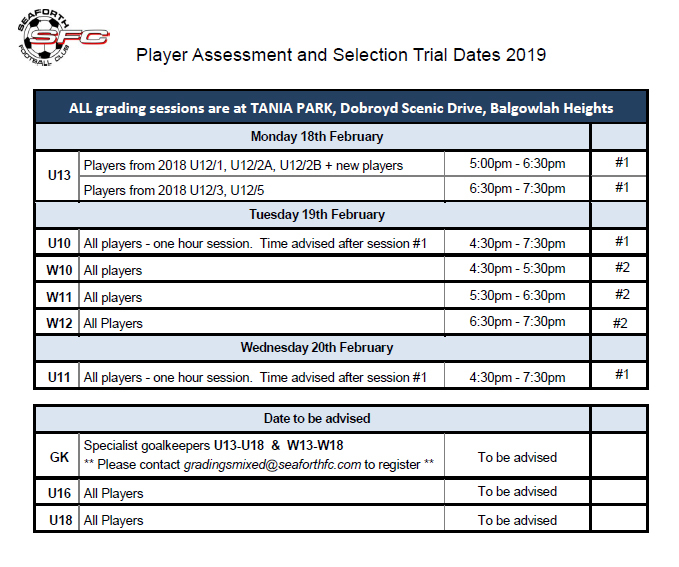 ALL grading sessions are at TANIA PARK, Dobroyd Scenic Drive, Balgowlah Heights. If you have questions, please contact your age coordinator. Players need to arrive at least 15 minutes prior to the start time in order to register for the session. Players need to wear shin pads and boots and bring water and sunscreen. You don’t need to bring a ball. All sessions are deemed “on” regardless of the weather. Any cancellations will be made on the day and a re-scheduled date and time will be advised. Please regularly check the club website for updates before the grading sessions. A comprehensive description of how Seaforth FC runs the processes of grading and team allocation can be found HERE. You can download a copy of the 2019 grading schedule HERE. For all graded players up to U12/W12 we do our best to keep friends/teams together, but as with all clubs on the Northern Beaches it is mandatory to go through the grading process. If the players are in and around the same ability we will absolutely do everything we can to get friends together, but this may not always be possible (particularly if there is a wide variance in their ability). For U9 to U11 Mixed/Boys and W10 to W11 Girls teams that are less competitive and more social, we will also do our best to keep these together. Individual players from these teams who wish to progress into more competitive teams are given the opportunity to move up out of social teams if they perform well in grading. After the teams have been allocated and published, if you decide to deregister and leave, this can have a major impact on your team and on other teams in the age group. This can result in a team being in danger of folding due to inadequate player numbers, other players can be greatly affected and a lot of effort may be required to re-adjust the affected teams. If a player cancels their registration after teams have been announced then a large portion of the total registration fee, required to cover the cost of effort to re-adjust teams, will not be refunded.